It's been a long time since I have been able to enjoy getting up on a Saturday without the assistance of an alarm clock, head into Camberwell, grab a paper and have a nice brunch. In the past, I would have been too tired, with an impending visit to the hospital looming, and would invariably spend most of the morning and early afternoon lounging around in my bed. So up and changed, what to do with myself? 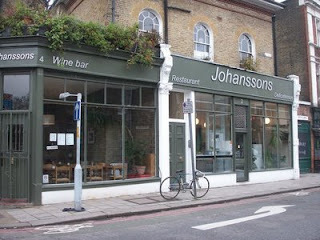 Well, there are a few places to get a decent brunch in Camberwell but my mind wandered to Johansson's at the end of Grove Lane. Now I've walked past this place many times but never been in. Recently, it has added a very appealing deli and I thought it was about time that I gave this place a go. And I'm very glad I did. On first appearance, this place is tiny but once you step through the front doors, it's a veritable tardis inside. A rabbit warren of interlinking rooms on various levels, it even has a room with a roaring fire! Warm and cosy, it feels like your dining in somebody's front room. Looking through the menu, I have to be honest; I was blinded by the Full breakfast. I noticed sandwiches, a daily special and a few other items. But I was here for a fry up and nothing was going to get in my way. With a pot of tea by my side (and an accompanying 70% Monbana chocolate!) and Guardian in my hand, I made myself comfortable and pretended I was in my front room. Breakfast without the hassle of actually making it! As an aside, it was at this stage that I noticed that everybody else in here had either a copy of the Guardian or the Times. How very middle classed! When the main event arrived, I wasn't disappointed. A proper brekkie. Mounds of buttered toast, thick cut rashers of bacon, porky sausages, I was in breakfast heaven. I even devoured the tomato covered in a mild basil pesto, not something I would normally do owing to my aversion to tomatoes. The only mild complaint I had was that the scrambled eggs were a bit runny and unseasoned. I will opt for the fried version next time. Once I had mopped up the last of the juice of the baked beans with the remnants of my toast, I still hadn't finished leafing through the multitude of supplements in this week's Guardian so I sat back, ordered a cappuccino and took my time. And a very good cappuccino it was too, a fine ending to a rather delightful brunch. Sated, I got up, paid my bill and left in search of a haircut. Heading over to Teamwork on Camberwell Church Street, I failed in getting shorn owing to a mere two people cutting hair and a reservation list as long as the eye can see. Pretty disappointing only having two staff cutting hair considering it's a Saturday. I set off home only to be showered in a freak hail storm. A bum note to a great lunch. Oh mate that is one full english breakfast! I just saw this in your sidebar and had to take a look. Myself and (now-ex!) colleagues still call this Seymour Brothers because that is what it was for many years. I must admit I do have a soft spot for the place. The staff are hilarious - mostly art students I believe. The service is incredibly erratic and the manageress can be rude if you catch her on the wrong day but it's all part of the charm. I like sitting out the back in the summer as they have amazing grape vines you can sit under. Fantastic place!! Love the food, the atmosphere and the Swedish management. Very, very interesting menue - have a look at the dinner menue and the wine list!